Good morning, my Cutting Edge Stencils friends! Summer might be coming to an end but our tropical stencils are sizzling HOT! 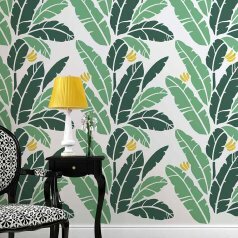 Incorporating the leafy botanical trend into your home decor just got a little easier with new tropical foliage patterns. They are perfect walls, furniture, and DIY decorating projects. These modern stencil patterns include palm fronds, hibiscus flowers, banana leaves, and flamingos. From exotic flair to tropical chic, we have the perfect stencil pattern that will help freshen up your home decor. Are you obsessed with the trendy Martinique Wallpaper? So are we! That’s why we created our Banana Leaf Allover Stencil, inspired by the iconic tropical print. 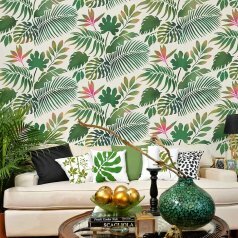 If you enjoy the simple beauty of large palm fronds and tropical leaves then you will appreciate this gorgeous foliage stencil pattern. Paint the Palm Fronds 3-Piece Wall Pattern or the Palm Fronds Wall Art and you may even feel the tropical breeze flow through your home! This stylized hibiscus flower motif is the perfect way to add tropical flair to your walls or painted furniture projects. 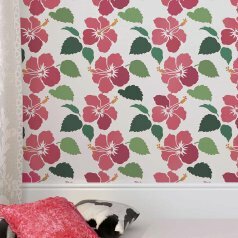 Create a wallpaper look using the Hawaiian flower wall pattern in bright colored hues! 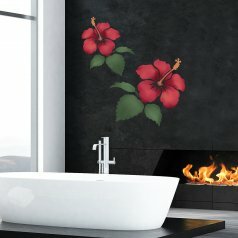 The Hibiscus Wall Art is an oversized flower pattern. 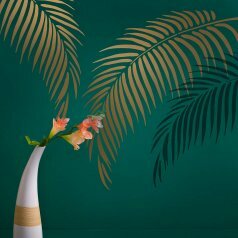 It’s an easy to use stencil pattern that will instantly add tropical flare to your space with a wallpaper look. Everybody loves gorgeous pink Flamingos! The whimsical Flamingo pattern is perfect for walls or painted furniture. 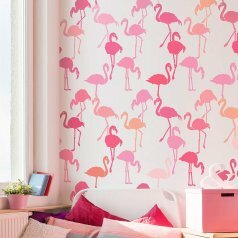 Embrace your flamingo loving spirit with this playful design. 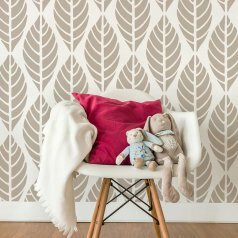 The Leaves wall pattern puts a modern twist on a classic nature-inspired design. Add a bit of flair to your DIY decorating projects. 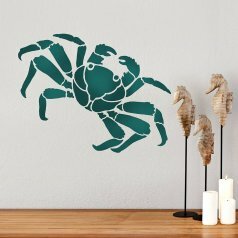 Complete your nautical decor with this fun loving beach crab stencil which comes in three sizes. 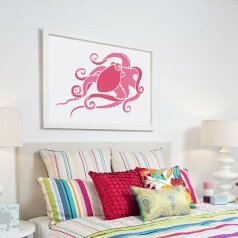 Our Octopus Allover Stencil is an amazing nautical design featuring a beautiful and mysterious sea creature. Let your imagination run wild with our new nautical stencil patterns that include the Octopus Wall Art Stencil, Octopus’ Garden Wall Art Stencil! That about wraps things up! Just so you know, all of our new stencil designs are located in the NEW Stencil Category on our site. Tell us, which new stencil pattern do you plan to use in your next decorating project? Leave us your thoughts in the comments below! Shop our stencils for sale and paint your nursery today!